Following his visit to Puerto Rico to deliver emergency supplies and see firsthand the widespread damage and devastation from Hurricane Maria, Governor Andrew M. Cuomo today launched the Empire State Relief and Recovery Effort for Puerto Rico. The effort brings together a wide range of civic, business and industry partners to provide needed services, goods and funds to help the people of Puerto Rico recover and rebuild, and provides opportunities for New Yorkers to contribute to the relief efforts. Attorney General Eric Schneiderman's Charities Bureau will monitor the fund to ensure the organization follows all necessary rules and regulations governing the solicitation of funds. JetBlue has committed to $1 million as an in-kind contribution to transport the customers and cargo for relief efforts. Governor Cuomo is the honorary chair of the effort, with Jennifer Lopez, Congresswoman Nydia Velázquez, Assemblyman Marcos Crespo and Cesar Perales serving as co-chairs. "After seeing the breathtaking devastation and unfathomable need for help firsthand in Puerto Rico, I am launching this effort to put the full weight of New York's resources behind the Puerto Rican people," Governor Cuomo said. "New York has a long and proud history of standing up to help those in need, and with millions of Puerto Ricans suffering, we must do everything we can to help our Puerto Rican brothers and sisters recover. I thank our partners who have already donated and encourage all New Yorkers to lend a hand as we work together to help this community rebuild." "Given the loss and devastation, we need everyone to pay attention and to urgently support Puerto Rico, the Caribbean, and Mexico City with donations and contributions," said Jennifer Lopez, Co-Chair of the Empire State Relief & Recovery Effort. "We know we must address the immediate needs and means of survival for the people while being focused on the long term rebuilding of the infrastructure of Puerto Rico, the Caribbean, and Mexico City. I cannot tell you what it meant to me and to the people of Puerto Rico to see New York not only pledge support but Governor Cuomo to actually show up with resources and supplies. It is now time for all Americans to be front and center in helping to bring awareness and solutions to the task of rebuilding Puerto Rico." "I am launching this effort to put the full weight of New York's resources behind the Puerto Rican people." Governor Cuomo has engaged the Partnership for New York City, the city’s leading business organization, to establish the Puerto Rico Relief & Rebuilding Fund at New York Community Trust, a public foundation, that will make grants to local charitable organizations in Puerto Rico that are helping with recovery and rebuilding from the devastation of Hurricane Maria, focusing on the most needy households and communities. Funds and in kind contributions are being solicited from the business community, with a minimum donation of $10,000. The drop-off sites will accept donations every day between 9 a.m. and 6 p.m.
A full list of charitable organizations for financial contributions is available on ny.gov/PuertoRico. Requested items include batteries, flashlights, portable lanterns, diapers, baby wipes, cases of water and feminine hygiene products. All items must be completely unopened and packaged. In coordination with this effort, the New York Mets are asking each fan attending games at Citi Field on September 25, 26 and 27 to bring donations for the relief effort to the ball game between 4:00 p.m. and 7:00 p.m. Additionally, the Mets will collect supplies between 10:00 a.m. and 6:00 p.m. on Thursday and Friday. Seth Lugo, pitcher for the Mets, joined the Governor’s announcement today representing the partnership. Provide logistical support to assist in obtaining and delivering medicine and medical supplies. Develop sister relationships between health care facilities in New York and those in Puerto Rico to provide comprehensive support during the long term recovery of Puerto Rico’s health care system. The Port Authority of New York and New Jersey is preparing to deploy emergency personnel to Puerto Rico to assist in the coordinated recovery efforts. The Port will assign 45 aviation staff to assist at San Juan International Airport and other airports in the Commonwealth, 11 Port staff to assess damage and assist with re-establishment of Port of San Juan operations, and 10 members of the Port Authority Police Department are available for search and rescue as well as support to airport security. In addition, the Office of Emergency Management will provide support equipment and four EMTs to assist. The Port Authority team will be an entirely self-sufficient operation. Robin Hayes, President and Chief Executive Officer, JetBlue, said, “As New York’s Hometown Airline® we understand the important bond our state has with the people of Puerto Rico who are in such great need today. That's why, as the largest carrier to the Commonwealth of Puerto Rico, we commend Governor Cuomo for leading the way in assembling New York businesses to immediately support the rebuilding effort. JetBlue may serve Puerto Rico from the air, but today our focus is on the critical work needed on the ground." Kathryn Wylde, President & CEO of the Partnership for New York City, said, “The business community is prepared to join Governor Cuomo in mobilizing funding and other resources to deal with both the immediate tragedy and long term challenges that Hurricane Maria has unleashed on Puerto Rico." Congresswoman Nydia Velázquez, Co-Chair of the Empire State Relief & Recovery Effort, said, “I commend Governor Cuomo for the actions he’s taking. On Friday we traveled to Puerto Rico together to assess firsthand the damage from Maria and deliver supplies, personnel and assistance. The launch of this effort is another important step that demonstrates New York’s commitment to helping our Puerto Rican brothers and sisters in their time of need. New York and Puerto Rico are inextricably linked. For New Yorkers, Puerto Ricans are family – for some figuratively and, for many of us, literally. New Yorkers take care of their family and this newest effort will help channel additional help from our state to the Island. This is a catastrophe of historic proportions that will require coordination at all levels of government. I will be advocating at the federal level for additional efforts, including swiftly repairing and rebuilding Puerto Rico’s electrical grid, helping small businesses recover and addressing the looming Medicaid cliff." Congressman José E. Serrano said, "The people of Puerto Rico are In need of help, and are looking to the Diaspora in New York, Florida, and elsewhere to help lead the way. We need all levels of government to help respond to this devastation, which is why I am grateful for Governor Cuomo's leadership and swift response in this dire moment." Senator José M. Serrano said, "While we continue to keep Puerto Rico in our thoughts and prayers, the unfortunate reality is that the recovery efforts on the island will take a long time and will require a great deal of resources. Thanks to the leadership of Governor Cuomo, the Empire State Relief and Recovery effort provides a way for New Yorkers to make a real difference toward the relief efforts for the people of Puerto Rico." Assemblyman Marcos Crespo, Co-Chair of the Empire State Relief & Recovery Effort, said, " Hurricane Maria brought devastation to the communities, homes and lives of our families, brothers and sisters in Puerto Rico, and as we only just begin to grasp the destruction Mother Nature has wrought, it is with hope – thanks to the leadership of Governor Cuomo, that our families will receive the help and resources they need to rebuild and recover stronger than ever before. Through the Empire State Relief and Recovery Effort, New York is one again providing a platform for residents across this state to lend a helping hand. We are providing medical assistance and personnel on the ground, and a food and water supply critical to ensure the safety of people of Puerto Rico. We remain committed to helping P.R. build back better than ever. To our families in Puerto Rico: New York is with you, shoulder to shoulder, every step of the way." Assemblywoman Carmen Arroyo said, "Helping those in need is the New York way and with this new effort, Governor Cuomo makes it clear that even if our federal representatives don't step up in the wake of Hurricane Maria, New York will. Puerto Rico faces a long and arduous path to recovery and we must invest in providing aid and assistance to these families. I encourage everyone to do what they can and help Puerto Rico during this difficult time. Assemblyman Phil Ramos said, "As our neighbors in the south continue to grapple with the aftermath of Hurricane Maria, I am encouraging New York residents to support the Empire State Relief and Recovery efforts made possible by Governor Cuomo. With tons of personnel and equipment being sent down to assist with recovery efforts, families stranded on the island are in need of food, water, and resources to rebuild. By standing together with communities across this state, we can make a huge difference in the lives of millions." Assemblyman Luis R. Sepúlveda said, "We urge our federal government to take action to help our neighbors in need, as Puerto Rican communities recover from the wrath of Hurricane Maria. New Yorkers are coming together, showing the world what it means to lend a helping hand, and I am proud to see our residents and businesses offering donations and nonperishable foods for stranded families. Puerto Rico has a long road ahead, but our brothers and sisters are rest assured that this state will be by their side the entire way." Assemblywoman Maritza Davila said, "New Yorkers stand together when faced with adversity, and while our friends and families are struggling to pick up the pieces in Puerto Rico, we will not stand idly by. I encourage our communities to support the Governor’s relief and recovery effort to save the lives of Puerto Ricans by making donations, volunteering, or providing nonperishable items to one of many drop locations across the state." Assemblyman Robert J. Rodriguez said, "The profound amounts of flooding and power outages across Puerto Rico are making recovery efforts extra challenging, and although our federal government will not step up to help our brothers and sisters in need, New York will. I commend Governor Cuomo for recognizing the dire situation faced by communities across the island and hope that New Yorkers in every corner of the state wishing to lend a hand will support recovery efforts, find a donation location nearby, and help our families recover." Assemblywoman Carmen De La Rosa said, "New Yorkers are heartbroken by the devastation caused by Hurricane Maria, and today we are letting the people of Puerto Rico know that New York stands with all of the island’s residents. Businesses from across the state are lining up to help those in need in the aftermath of Hurricane Maria. I want to thank Governor Cuomo for making all of this possible and look forward to working together with other state and local leaders and organizations to deliver for Puerto Rico. Assemblywoman Kimberly Jean-Pierre said, "So many of the islands in the Caribbean and Puerto have been devastated by the recent hurricanes. And I stand with my colleagues in government to bring ‎relief efforts to those affected areas. During these days we must come together globally to help those in need." Onondaga County Executive Joanie Mahoney said, "New Yorkers know full well the devastation that Mother Nature can create. Our hearts and minds are with all Puerto Ricans, as they deal with the aftermath of Hurricane Maria and the inevitably long road ahead. In times of adversity, it is our responsibility to look after one another, and as New Yorkers, we have experienced the same generosity and compassion from our friends and neighbors. We are in full support of Governor Cuomo's relief efforts for Puerto Rico and encourage all New Yorkers to join the recovery mission in the spirit of love and empathy. Broome County Executive Jason Garnar said, "The devastation that Puerto Rico has suffered at the hands of Hurricane Maria is nothing short of horrific and I applaud Governor Cuomo‎ for launching such a massive effort to support the island's recovery. As New Yorkers, it is in our DNA to help others in their time of need and Broome County is proud to follow the Governor's lead and lend any assistance we can.‎ Often times, the worst situations bring out the best in people and to see such a diverse coalition coming together for this important cause is truly inspiring.‎"
Buffalo Mayor Byron Brown said, "Buffalo has one of the nation's largest and most vibrant Puerto Rican communities and to support them during these difficult times, the Queen City is proud to join Governor Cuomo's statewide relief effort. We know from first-hand experience that the only way to overcome Mother Nature's devastation is with the help of friends. ‎Puerto Rico has a friend in the City of Buffalo and we will continue to stand by their side as they recover and rebuild." Albany Mayor Kathy Sheehan said, ‎"The people of Puerto Rico deserve the compassion and generosity of their friends and neighbors, as they begin to assess the destruction from Hurricane Maria. As New Yorkers, we must come together, as we always have in times of difficulty, for our friends in Puerto Rico and do all that we can to help. The City of Albany is proud to support Governor Cuomo's recovery and relief effort, and I encourage all New Yorkers to act with their hearts and minds, as our neighbors have done for us in our time of need." George Miranda, President, Teamsters Joint Council 16 & President of Teamsters National Hispanic Caucus, said, "As our brothers and sisters in Puerto Rico face the long road of recovery ahead, it is critical we make it clear that New York will stand by them every step of the way. With this new Empire State Relief and Recovery effort, Governor Cuomo offers Puerto Rico real and tangible relief for the weeks and months ahead. I am proud to join the governor to offer aid and assistance to our friends in need." Bea Grause, HANYS President, said, "We are pleased to be working with the Governor to coordinate efforts to help the people of Puerto Rico. New York's hospitals and health care providers know first hand the challenges of recovering from a major storm, and we stand ready to lend our expertise and assistance." Monsignor Kevin Sullivan, Executive Director of Catholic Charities of the Archdiocese of New York, said, “With over a million Puerto Rican-Americans that call our state home, New Yorkers should do all we can to help our family and friends on the island. The Empire State Relief and Recovery Effort will not only offer hope and compassion from the state of New York – it will provide critical water, food and resources needed for families to recover and rebuild. 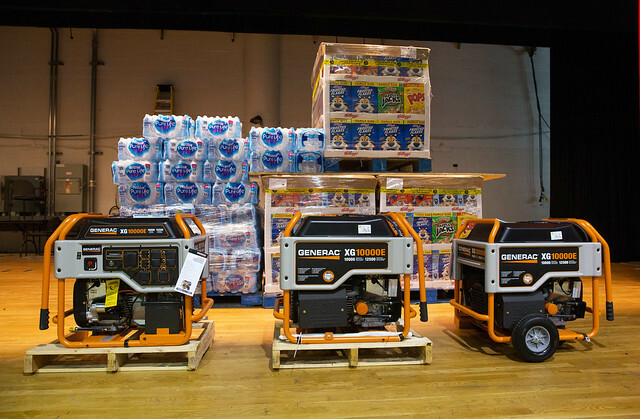 I commend Governor Cuomo and other New Yorkers leaders from the business, philanthropic and nonprofit sectors for launching this relief effort." Rosa J. Gutierrez, CEO of the Puerto Rican Family Institute, said, "We at the Puerto Rican Family Institute are committed to serving alongside other leading organizations from New York's Puerto Rican community as we work in unity to bring much needed aid and relief to our families living in the mass devastation left by Hurricane Maria. I am inspired by the overwhelming love and support from all who have donated their time, money and emergency supplies to be shipped to Puerto Rico. We thank Governor Cuomo for his leadership and are grateful for any assistance the Empire State Relief and Recover Effort can offer as we work with our families in Puerto Rico to recover and rebuild." Casimiro D. Rodriguez Sr., President, Hispanic Heritage Council of Western New York Inc., said,"The Hispanic Heritage Council of Western New York Inc.and the Buffalo Community, would like to thank Governor Cuomo for the establishment of the Empire State Relief and Recovery Effort. Through this worthy program, New Yorkers from Buffalo to Brooklyn can help our friends and families in Puerto Rico to rebuild and save lives. Every donation will make a difference, please find a location near you." Additionally, 60 members of the New York Army National Guard, four Black Hawk helicopters and 50 State Police are on standby. New York State shares many deep ties with Puerto Rico, with many New York-based companies employing thousands in Puerto Rico at locations across the island. In addition, 1.2 million New Yorkers, or 5.7 percent of the population, are of Puerto Rican ethnicity. This means that more Puerto Ricans live in New York than anywhere else outside the island. According to estimates in the 2016 American Community Survey, there are 280,904 residents in the State of New York who claimed Puerto Rico as their place of birth. This trip was not this first time that Governor Cuomo's has visited Puerto Rico either. In 1998, as Secretary for Housing and Urban Development under President Bill Clinton, then-Secretary Cuomo traveled to the island in the aftermath of Hurricane Georges to assess damage and speed up the delivery of federal assistance. Further, in 2015, Governor Cuomo traveled to Puerto Rico twice as part of solidarity missions to assist the island with its ongoing healthcare crisis and economic challenges. Photos of the trip are available here. VIDEO of Governor Cuomo surveying damage in Puerto Rico is available on YouTube here and in TV quality (h.264, mp4) format here. VIDEO of Governor Cuomo and Puerto Rico Governor Ricardo Rosselló surveying damage from a Black Hawk helicopter is available in TV quality (h.264, mp4) format here. VIDEO of a community viewed by the governors from the helicopter is available in TV quality (h.264, mp4) format here.